Hi Everyone! 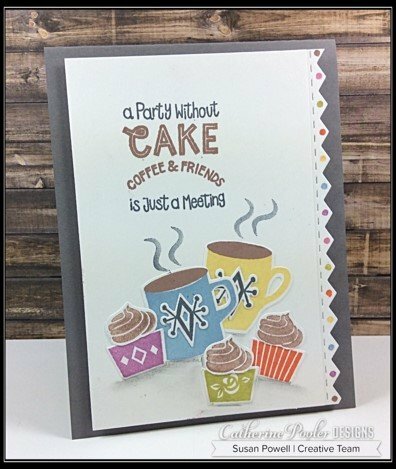 It's Susan and I'm thrilled to be here sharing a card today that features the I Eat Cake stamp and die sets, the Perfect Blend stamp set and the Morning Joe Dies. 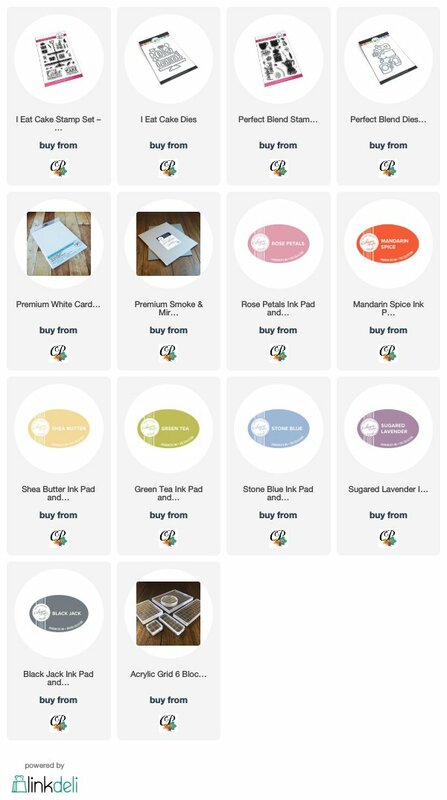 I started by stamping all of the images you see in a variety of colors from the Spa Collection and die cutting them all with their coordinating dies. After arranging and adhering them to a white card panel I stamped the steam with Black Jack ink using second generation stamping and then I performed a little stamp surgery. I knew I wanted to use the “a Party Without CAKE is Just a Meeting” sentiment and the arched “coffee and friends” sentiments and two different colors of ink. I could've done some masking, but honestly, I tend to mess up more often than not when there's that much masking to do on a sentiment. Instead I cut the sentiment apart and stamped each piece individually. It works perfectly every time and when you don't need to do any masking just place them all together on a block and it's as if you never cut them up in the first place. It's brilliant! The edge piece is die cut from white card stock using the ric rac border die from the Morning Joe die set. I adhered that to the panel and then using all the same ink colors I added a stamped dot to the center of each point. To finish off my card I adhered the panel with craft foam to a piece of Smoke card stock cut to 4 ¼” x 11″ and scored at 5 ½” and added a little shading with a black pencil crayon and smudging it a bit with my finger.